Traditional tales are a part of all cultures. They are often told to teach life’s lessons and are also often ‘cautionary tales’, to warn people about the dangers of vanity, greed, telling falsehoods and other transgressions. Part of setting the context is reminding students what they know about traditional tales and their important role in most societies. Competition in sport in also assumed background knowledge for understanding this tale. Show students a picture of traditional Sumo wrestling. Ask students if they have ever seen this type of sport before, and if they know which country it is associated with. Pictorially, compare Sumo wrestlers with a picture of other wrestling and/or boxing. What do students notice about the size of the sportsmen? Ask students to look at the depictions of Ni-ou or Dokkoi on the front cover illustration. Students work in pairs to create an ‘in-character’ response from the other character based on the illustrations and their interpretation of the body language conveyed by Junko Morimoto. Students role play the conversation between Ni-ou and Dokkoi. Students justify their chosen dialogue by referring to the front cover illustration, the positioning of the characters, the distance between them, relative size, their eyes, facial expressions and body gesture. Working in pairs students extend their imaginary dialogue between the two characters for the front cover. Add speech bubbles to a copy of the front cover image for students to complete. Students justify their chosen dialogue based on what they know about the characters so far. Students might return to this dialogue to extend it or make changes as their understandings of the characters develop. Teachers point out that the blurb continues: ‘Who do you think will win when these two bullies get together?’ Ask how the blurb has set readers up to think of the two men as ‘bullies’. Discuss students’ interpretation of the word ‘bully’ and the way it might have been used by the composer in an earlier time and in another country. Ask students if someone who wants to excel is a bully. Is a braggart automatically a bully? What attributes make these men bullies? The teacher reads another picture book by Junko Morimoto, e.g. The Inch Boy, and models selecting relevant information to answer the questions: How does the front cover illustration relate to the subject matter of the picture book? How do students know that the story and illustrations refer to Japanese culture? Teacher and students jointly complete a think sheet (see table below for an example). Students work in pairs or small groups to examine the front covers and blurbs of other picture books by Junko Morimoto and add to the sheet. Teacher models writing a coherent response about the writer’s choice of front cover illustration and the connection with the story, based on the selected information from the previous activity. Students use their information to write a short response based on the teacher model. Conduct a shared reading of the book. Ask students to return to their thoughts about bullies and determine whether the two men fit their ideas of how bullies behave. Teacher prepares a three level guide (page 118) based on a factual text about the tradition of Sumo in Japan. The purpose of the guide is to help students understand the origins, features and significance of Sumo wrestling in Japan in order to appreciate the cultural influences evident in Morimoto’s work. Teacher models how to use the guide for each of the three levels of understanding. Students examine and compare a range of images of sumo wrestlers and the images used in The Two Bullies. Is there a relationship between these images and those used by Junko Morimoto in The Two Bullies text? Reread the story. Tell students they are going to look more closely at interpreting what the composer, Junko Morimoto, is showing readers and viewers through her words and pictures. In the second blue text box, the word ‘nobody’ is italicised. Look at the picture below the text box and the expressions on the faces of the three characters. Point out the footwear of the man held by Ni-ou. What does their placement on the picture suggest? What has the composer suggested by these illustrations? For example, did nobody even try to beat him? Did his size make people think he was strong? The picture book has no page numbers. On the page where Ni-ou was going to the temple, it says he was going there ‘to pray for victory’. What might this suggest about his character? Again, ask students to observe the illustration that accompanies those words, noting Ni-ou’s stance and expression. Teacher explains and models simple interview and questioning techniques e.g. literal fact-finding questions, questions that require explanation and connection of ideas and questions that seek an opinion or evaluation. The emphasis in the modelling is on identifying the purpose of the questions. Teacher explains interview technique and question styles i.e. how different types of questions elicit different responses. Display some examples and discuss, e.g. In pairs students devise questions they could ask each other about their involvement in a sport or other pastime they are interested in. The questions should be designed to not only elicit literal (factual) responses but some that require explanation and opinion. Teacher models how to take notes for a particular purpose from a spoken text. A student reads a short text to the class about Junko Morimoto while the teacher demonstrates how to take notes. These notes are shared with students. The teacher points out the structure of the notes as well as language features such as key vocabulary, incomplete/short sentences, as well as the main ideas. Students watch an interview with Junko Morimoto about her picture book My Hiroshima. They select relevant information from the interview about how her experiences influenced her purpose for writing and illustrating. Students are asked to take notes to collect relevant information under headings. Provide the headings to guide students’ listening (depending on parts of interview selected). For example, her purpose in writing My Hiroshima, her life before the bomb, etc. Note: It may be necessary to provide students with some background information before they view the interview. Teacher converts information from this interview for a dictagloss activity (page 121). Students share the notes they develop in the dictagloss with a partner and then with a larger group. With teacher guidance students may categorise their information as fact, explanation, example, opinion, or feelings where appropriate. For each identified category of response teacher discusses the language features associated with each category. For example, which words/sentences signal an explanation or opinion? After students independently read The Two Bullies they work in small groups to prepare a variety of questions and their responses for a role-play interview with Junko Morimoto about The Two Bullies. With teacher guidance students develop and apply a marking criteria to peer assess the quality of the questions and responses for the mock interviews with Junko Morimoto. Criteria should relate to levels of questions, quality of information sought and presented and ability to use vocabulary to express opinions and extend ideas. Given a short transcript of an interview with another writer such as this one with Aaron Blabey. Students identify and categorise the responses in terms of fact, explanation and opinion, indicating the language choices that provide evidence for their categorisation. The teacher deletes the questions and students construct questions (identifying their purpose) based on the responses provide by the interviewee. Teacher explains the concept of an underlying theme – the important ideas that are what a story is really about, and are often about human traits that go across cultures. 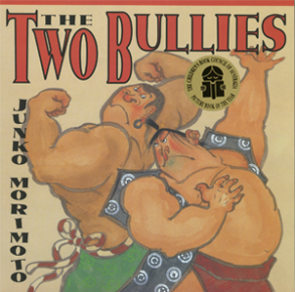 The Two Bullies is based on an old traditional Japanese story and has been interpreted in both words and pictures by Junko Morimoto. Both men are more frightened by the idea of each other and would rather avoid fighting altogether. Discuss what the themes might be in the story. Provide students with a selection of picture books, e.g. Pearl Barley and Charlie Parsley, The Lost Thing, Luke’s Way of Looking. In groups students discuss the underlying theme of the books. Examine the role and depiction of the old woman in The Two Bullies. Support students to identify particular techniques used by the illustrator, such as layout, perspective, colour and how these contribute to the meaning. Discuss: How is the old woman represented in the illustrations? How does she respond to Ni-ou? Does she conspire to frighten Ni-ou by suggesting the trembling is Dokkoi and not an earthquake? Teacher models gathering information about the character of the old lady using evidence from the verbal and visual texts, using a scaffold. Teacher draws attention to the illustrations of the old lady, e.g. relative size, facial expression, colours used, posture etc. Students gather character information about Ni-ou or Dokkoi using the same scaffold (for additional information on visual literacy see Callow J. The shape of text to come. PETAA, 2013). Teacher models converting the selected character information about the old lady into a single paragraph character profile (see an example template below). Students use their character information about Ni-ou or Dokkoi to write their character analysis. Did the character change in any way because of events? How does the old lady interact with the other characters? What does this reveal about her? Use the information you have selected to answer the following questions: What does Junko Morimoto want the reader to believe about the old woman? How has the writer used language and illustration to build ideas about the old woman? Teacher uses a three-level guide based on The Two Bullies to help students read for detail and locate facts, make connections in the text and interpret ideas as well as make judgements and consider opinions about the text. The guide should include statements about the illustrations as well as the text. It is important that students justify their responses to the statements in the ‘guide’ as part of a follow-up class discussion. Teacher models how to connect the ideas from the three level guide (page 118) cohesively to form a personal response to the story. In particular, teacher modelling should draw attention to the language associated with evaluation (links to the Level 3 statements of the three level reading guide). Using information from their three level guides students write a short response text that gives descriptive detail about characters and events, explains the plot and how the characters respond to events as well as offering their opinion about the story. In pairs students discuss how the writer presents Ni-ou and Dokkoi at the end of the text when they are relaying their version of events to an audience. The pairs then form groups of four and discuss how the representation of the characters might relate to the concept of respect and maintaining dignity. Students select one character from The Two Bullies and an event involving this character. The student then creatively extends the dialogue and details of the event, maintaining the same style and humour of the writer. Or, students could convey this information by developing another illustration and adding speech bubbles. Students write a personal response to The Two Bullies that includes descriptive information about the writer, the theme of the book, characters, a recounting of events and their opinion of the book. Understand how language features are used to link and sequence ideas. They understand how language can be used to express feelings and opinions on topics. Their texts include writing and images to express and develop in some detail experiences, events, information, ideas and characters. Use language features to create coherence and add detail to their texts. They understand how to express an opinion based on information in a text. They create texts that show understanding of how images and detail can be used to extend key ideas. The ‘non-event’ clash between two strong men is delivered at a rapid pace (in the text and illustrations) using both exaggeration and irony. Display the opening pages of the book drawing attention to their features. The writer poses a question before the story begins: ‘Do you know the big statue called Ni-ou that stands by the temple gates’. After reading the text ask students to consider: What is the purpose of this question and is an answer provided? Turn to the next double-page spread. What is the purpose of background information provided by the writer at the beginning of the story? How does the related illustration support the background information? Provide a list of vocabulary items from the story. Point out that many of the words can be a noun or a verb, depending on how they are used. Many of the words can be changed into other words, that are still related in meaning but need to be read in a sentence so the reader knows what kind of word it is. Prefixes often change the meaning of a word (e.g. appear, disappear), while suffixes change the type of word (e.g. powerful, powerfully; challenge, challenging). Below are some words from the text in their original and changed forms. Have students create new words from the following: proud, fellow, prepare, shout, sound, depend. Consider the pace of events: How does the writer pace events? For example, Ni-ou rows a boat from China to Japan. How do the sentence structures support the pace of events? For example, short sentences are used at key points in the story, e.g. ‘But Ni-ou didn’t come’. How does this technique help build tension? Consider the ‘matter-of-fact’ writing style that makes unlikely events seem possible. For example, Dokkoi throwing an anchor out to sea. Examine the dialogue attached to certain events and their effect on the reader. For example, the use of short sentences to maintain the pace of the story and the use of very informal/humorous language to accompany certain events. An example from the text is: ‘”Whoa!” he said. “How amazing to see him rip that chain apart”‘. The Two Bullies deals with the serious topic of the nature of bullies. How does the writer use humour in the text and illustrations to make a serious topic seem funny? Students could record information about particular events, character’s dialogue and responses to events as well as the illustrations to answer this question. Teacher models this thinking and note-making process using an example from the text. Teacher allocates sections of the text to pairs or small groups. Students write their ideas on post-it notes individually first. Each group then selects and organises the best responses looking for any gaps in information. Teacher combines the student responses into a single cohesive text that answers the question. This text is then used shortly after as the basis of a dictagloss activity (page 121). The writer does not use a lot of descriptive language. Explore the idea that the illustrations provide a lot of the descriptive detail for this story. Teacher models converting the information conveyed in an illustration into a written description, including simple inference and opinion if appropriate. Students work in pairs to select an illustration to convert into a written description based on the teacher modelling. Students extend the story creatively by continuing a conversation about the events between Ni-ou and his audience near the end of the story. The conversation should capture the style and humour of the writer and logically extend the story. The dialogues could be written down and performed as a ‘Reader’s Theatre’. The background colour for the text and illustrations is plain and parchment-like in colour. The fluid brushstrokes of the characters have a distinctly Asian-style, almost a writing style. Look at the double page spread where Ni-ou is fleeing from Dokkoi’s house. There are times when the text does not quite match the severity of the situation. The text acts as a humorous ‘foil’ to the illustrations of events. The text describes that he ‘climbed out of the toilet window’. What does the illustration infer? How did he climb out? Point out that meanings are often inferred by demanding that the responder to the text combine the images with the words. Students identify another example of this tension between the illustration and the text and describe the effect this has on the reader. The final sentence on that same spread has the complex sentence: ‘He jumped into the boat and rowed for Japan as if his life depended on it’. The underlined clause is dependent and says how he rowed, but it also suggests why he rowed so hard. In small groups students locate other examples of complex sentences and consider what additional information is provided by the dependent clauses. The placement and perspective of illustrations also contributes to the humour and pace of the story. For example; the distance between Japan and China, Ni-ou looking down on the old lady, the full page close-up illustrations of Ni-ou and Dokkoi at key points in the story. Discuss the effect of these deliberate techniques by the illustrator, and teacher models how to describe the techniques and their effects on the reader (an interpretive response). In particular provide vocabulary support for the description of techniques e.g. brushstrokes, colour, perspective, position, shot choice, offer/demand, salience etc. Students select an illustration from The Two Bullies and critically analyse the image. Use the seven strips note-taking (PDF, 100KB) technique but modify it to encourage students to gather information about, for example, the style, position, size of an image and offer interpretations about the effect on the reader for each of these observations. Students individually convert this information into an interpretive response. Students and the teacher jointly construct marking criteria for an effective analysis of an illustration and an interpretive response to the text. Criteria should include the students’ ability to use technical vocabulary to describe the illustrator’s techniques and their effect as well as their ability to creatively interpret the deeper meanings of the text. In pairs students use the criteria to assess each other’s work and give feedback about strengths and weaknesses. Teacher does the same and the two sets of feedback are compared. Visit the Asia Education Foundation for additional resources to support teaching about Asia and Australia’s engagement with Asia. Blabey, A. Pearl Barley and Charlie Parsley. Penguin, 2007. Tan, S. The Lost Thing. Hachette, 2000. Wheatley, N. & Ottley, M. Luke’s Way of Looking. Hodder Headline, 1999. Callow, J. The shape of text to come – How image and text work. PETAA, 2013. Humphrey, S., Droga, L., Feez, S. Grammar and Meaning. PETAA, 2012. Duration Three to four weeks, assuming several sessions each week. The book should be read in both shared, modelled and independent reading sessions. The text is about the lengths that two ridiculous strong men will go to in order to preserve their reputations. It is not a text about bullying per se, rather it provides a glimpse of the easily recognisable characteristics of bullies using Japanese culture and tradition as the vehicle. Junko Morimoto does overtly teach the reader a ‘lesson’ through her text and images. SHELLEY WYLIE currently works for University of New South Wales Global (UNSWG) developing educational assessments, predominantly in the area of English reading. She has delivered professional learning for teachers in relation to quality assessment and literacy in NSW at state, district and national forums. She is particularly interested in the way literacy is developed in the middle years of schooling. As a NSW DET literacy consultant she supported schools to develop literacy in all subject areas.